pCloud has a great new service to offer! This is the pCloud Transfer! You can send multiple files up to 5GB for free. Simply go to https://transfer.pcloud.com/ and enjoy the freedom of file sharing with your friends and colleagues! To use this new free file transfer platform you don’t need to be a registered user. Basically, through this new and independent service you can send multiple files (up to 5GB in size) to other users, who also don’t necessarily need to be registered users of pCloud. However, if you register to the pCloud service, you will be able to send files with unlimited size, as long as your quota allows. 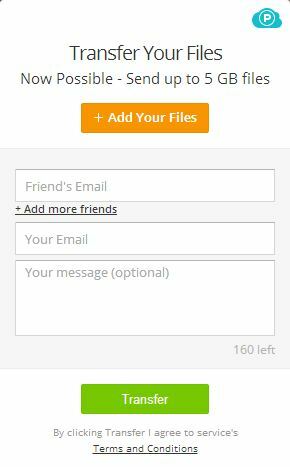 In order to use pCloud’s new file transfer platform, simply enter your friends’ or coworkers’ emails, as well as your email address, add the files you intend to send, and optionally, enter a message to your friends, explaining details of the content you are sending. When you are ready, click the Transfer button at the bottom of the screen and observe the progress of your transfer. It happens instantaneously! Your friends and colleagues will receive an email notification for the transfer you are performing, containing information about the sender, a list of the files sent, an expiry date for the files, an option to Download the files and an option to register to the pCloud platform. You will get a notification whenever your friends open their emails, containing the files you are transferring. So, this way you can safely transfer your files and enjoy pCloud’s new free service! And remember, if you register to the pCloud file storage service at https://www.pcloud.com/ you will get even more – unlimited file size transfer to unlimited number of users, no speed or file size limits and many other cool features!